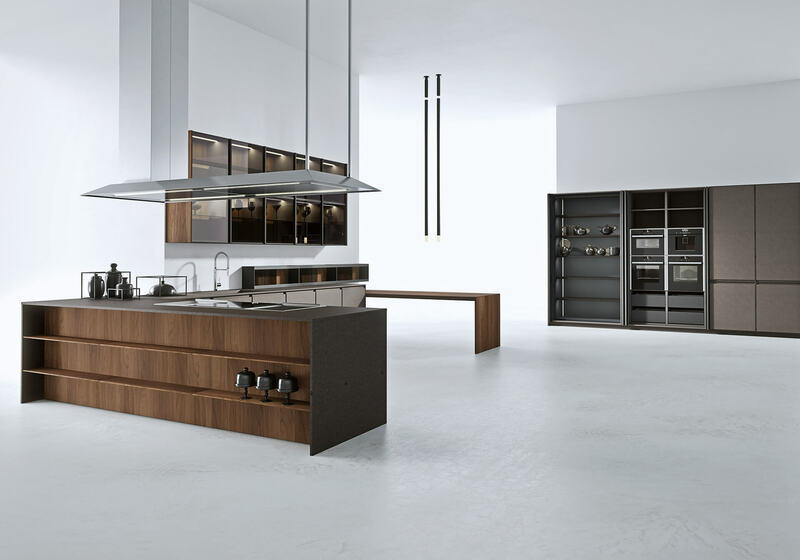 An exclusive project conceived by the capable hands of two expert figures, designer Franco Driusso and chef Andrea Berton, transferring the practicality of a professional kitchen to a domestic environment, enriched by a modern design. 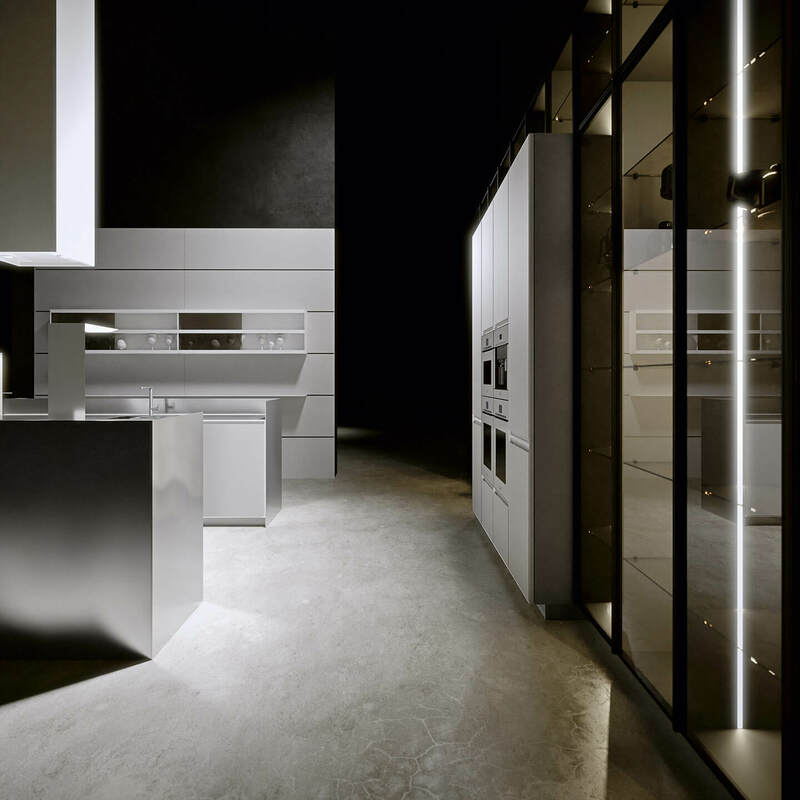 For the first time, a domestic kitchen has been designed and developed in line with needs for high performance and practicality, expressed by a haute cuisine professional, above all without compromising on the clean lines and modular elegance typical of Arrital design. 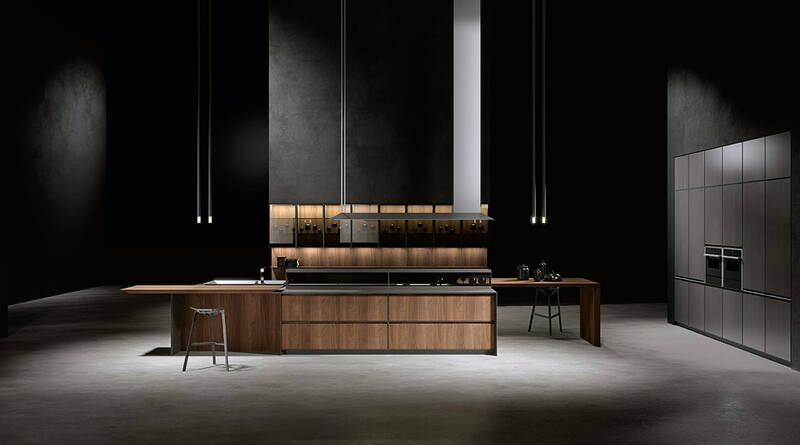 Appliances and the organisation of spaces, accessories and materials have been carefully selected, reflecting the watchful eye of the chef and designer, who worked together on every single aspect of the design, each making their own precious and unique creative contribution. 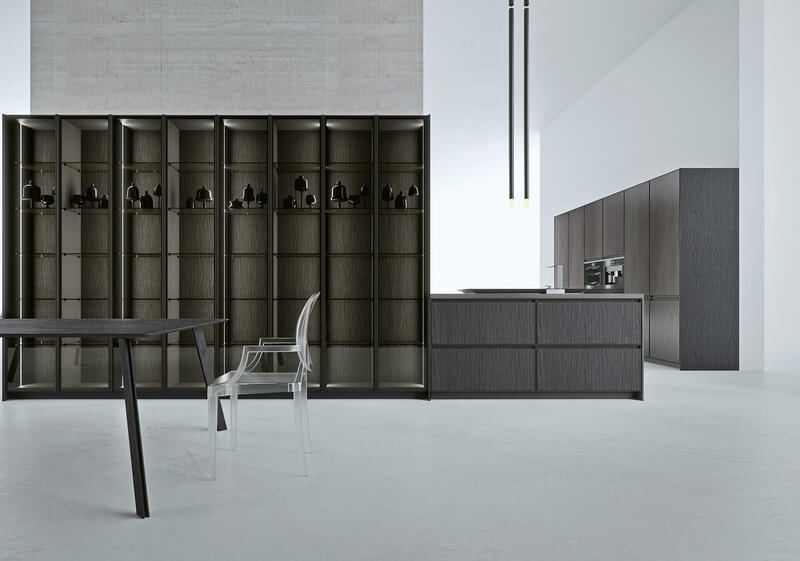 “AkB_Case”, the two-level storage area also acts as a partition. 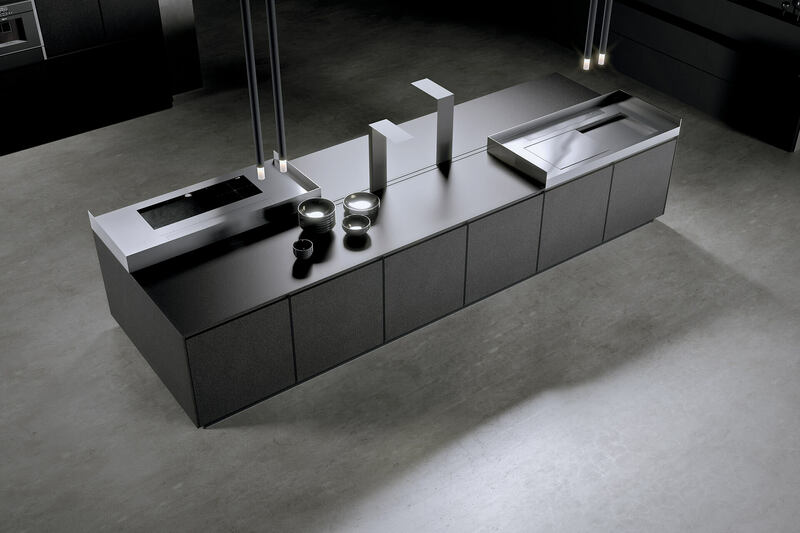 It can be placed on the work top, table or island depending on your work and space requirements. 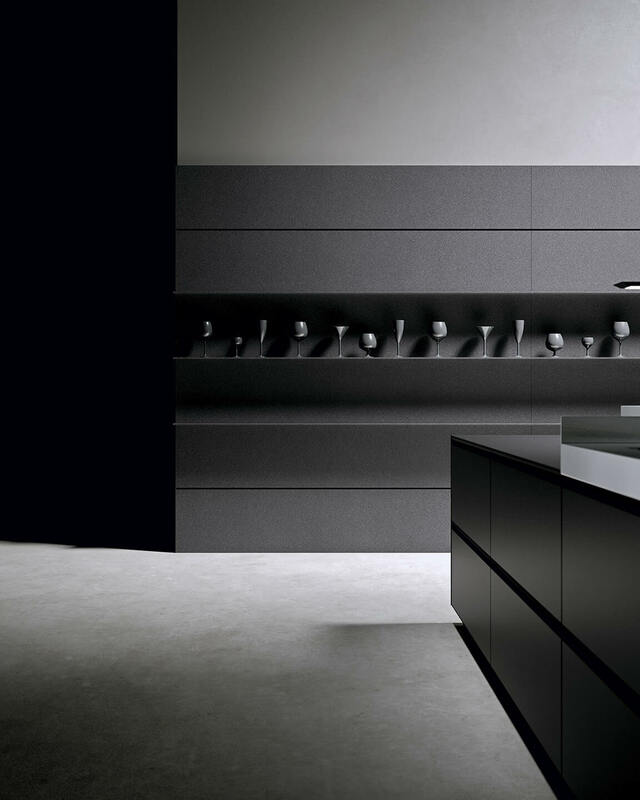 The “Majestic” sink revamps the washing area with a contemporary twist. 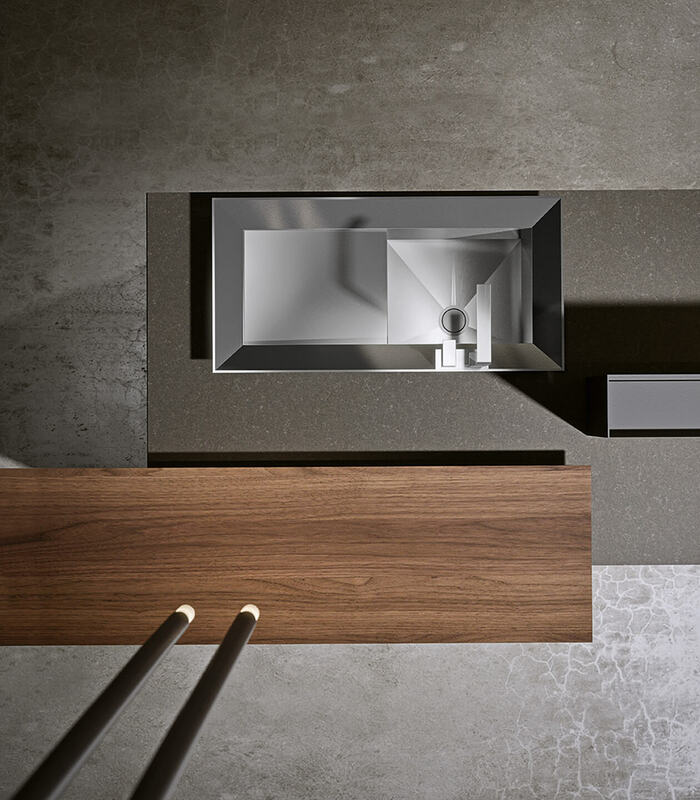 The raised steel edges, sloping inwards, not only lend character to the design, but are also a useful functional touch for collecting water and splashes to keep the work area clean. 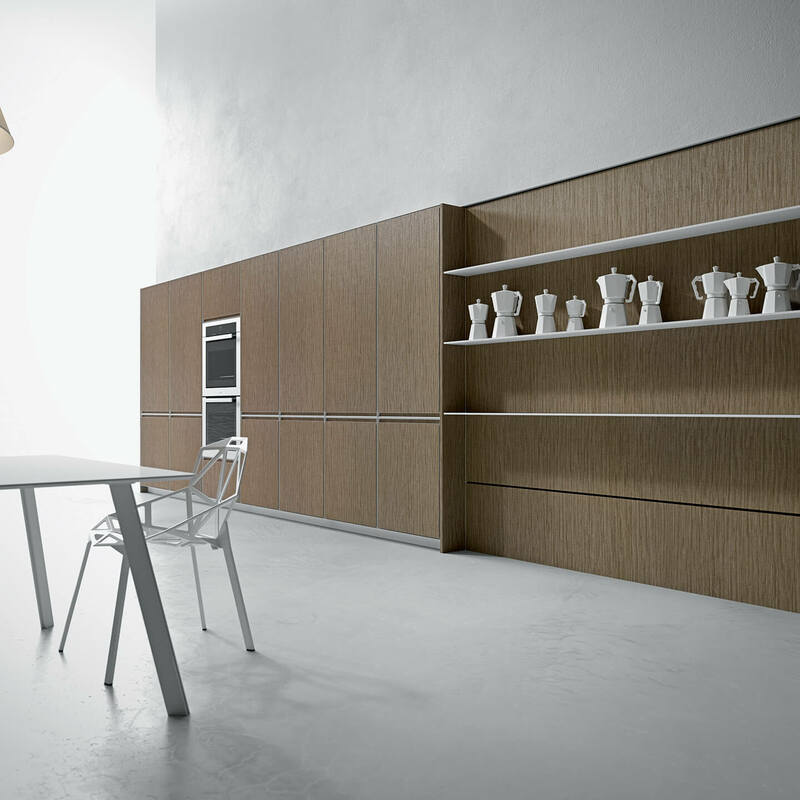 The Akb_08 system encompasses technical and aesthetic innovations, such as those applied to the special Tissue woods. 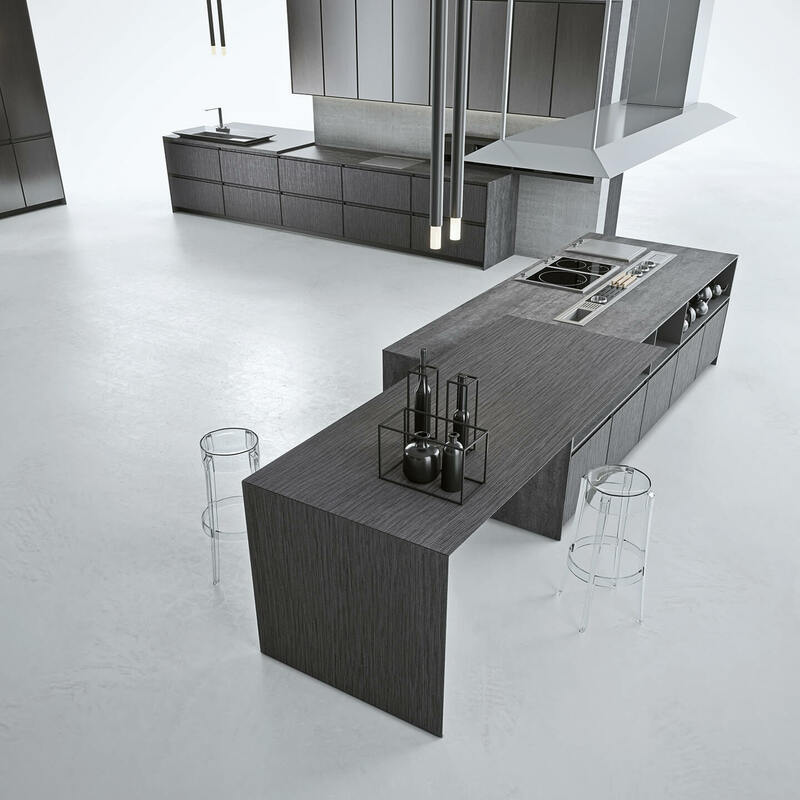 These finishes allow the designer to create unique and exclusive environments with a strong personality, thanks to the raised textures impressed on the surface of the front panels, using special working techniques. 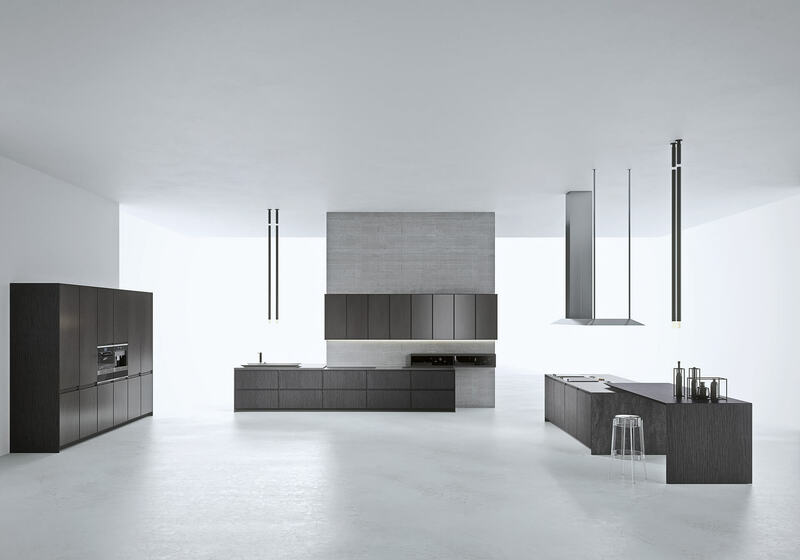 A distinctive feature of AkB_08 is the “Floating Core” door and frame in which the aesthetic lightness of origami is combined with the solidity of a sturdy aluminium frame, to stamp a new look on home design. 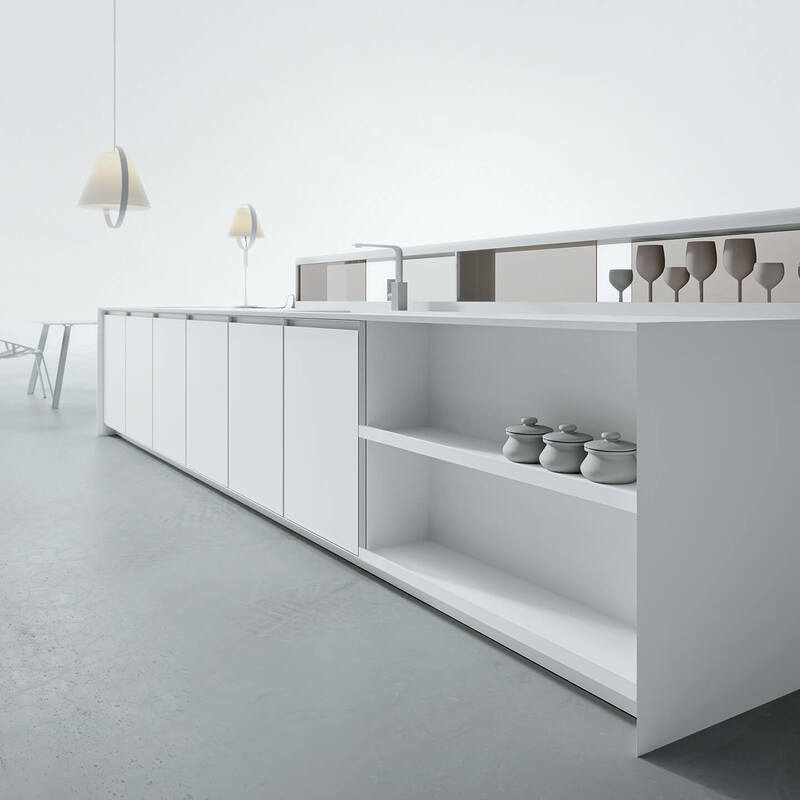 The frame, available in Ardesia and Bianco finishes, allows the application of slim front panels available in numerous lacquered, veneered, Fenix Ntm and Corian finishes. 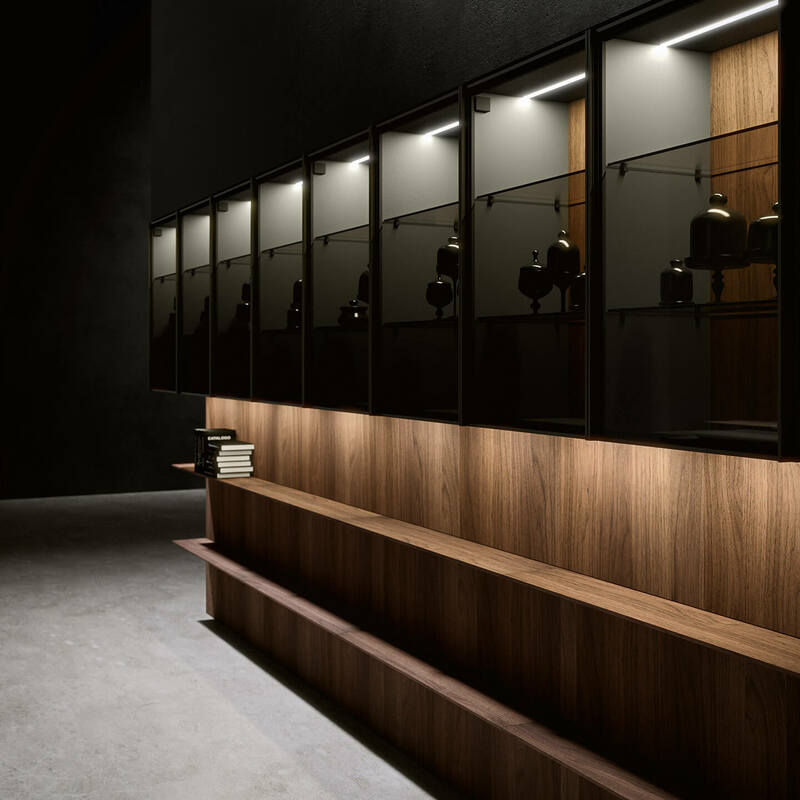 AkB_08 features a patented lighting design, “Focus On”, which provides dynamic lighting over the counter top, moving to wherever the chef is working. 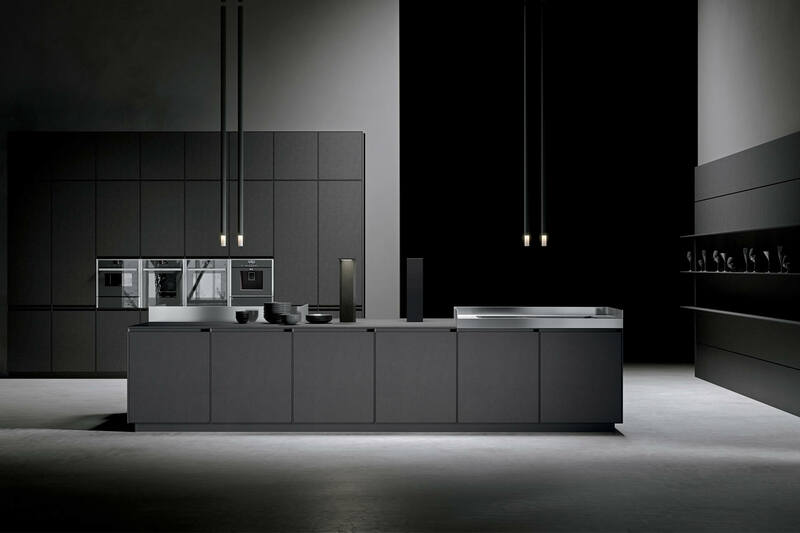 The led lights move along a support guide fitted over the counter top so that they slide into position and are recharged when set to “off”. 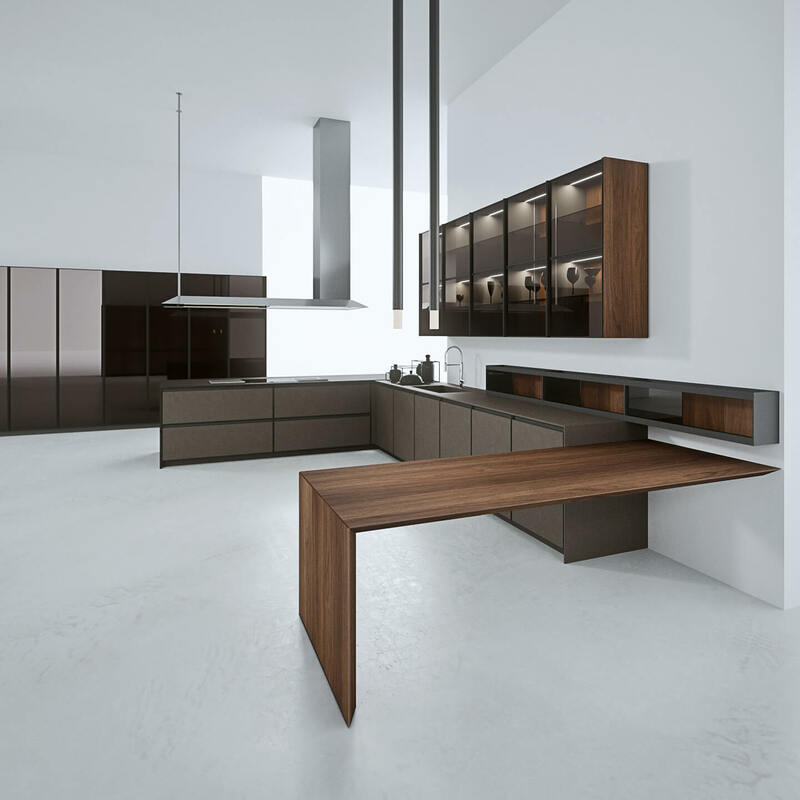 A minimal design to offset the complexity of a technological solution. 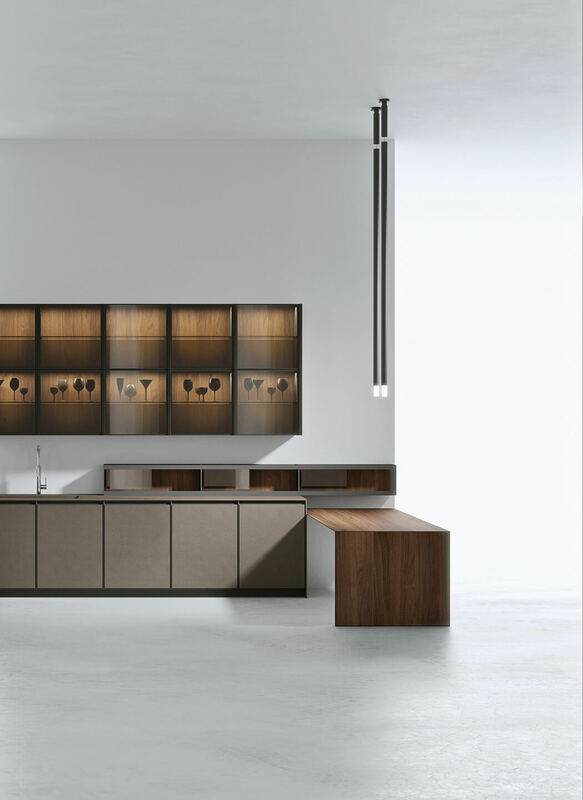 The modularity of Arrital allows for truly personalised kitchens; the use of 75 cm-wide doors allows the dishwasher area to be equipped with a steel-finish open housing space, perfect for storing dish washing and furniture cleaning products in general. 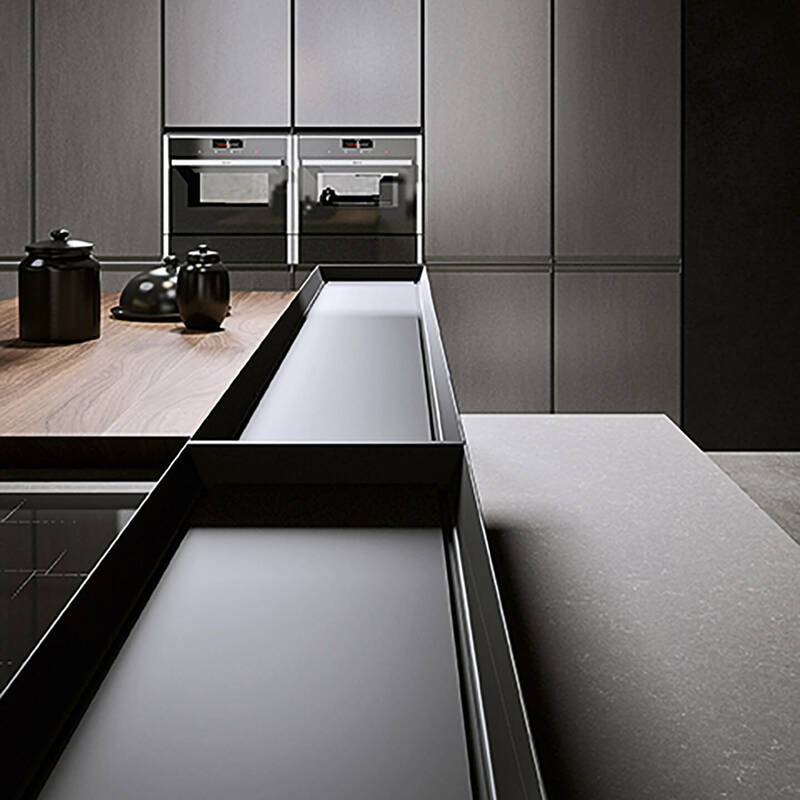 The soft-touch smudge-proof matt surfaces are the main feature setting Fenix Ntm® apart. 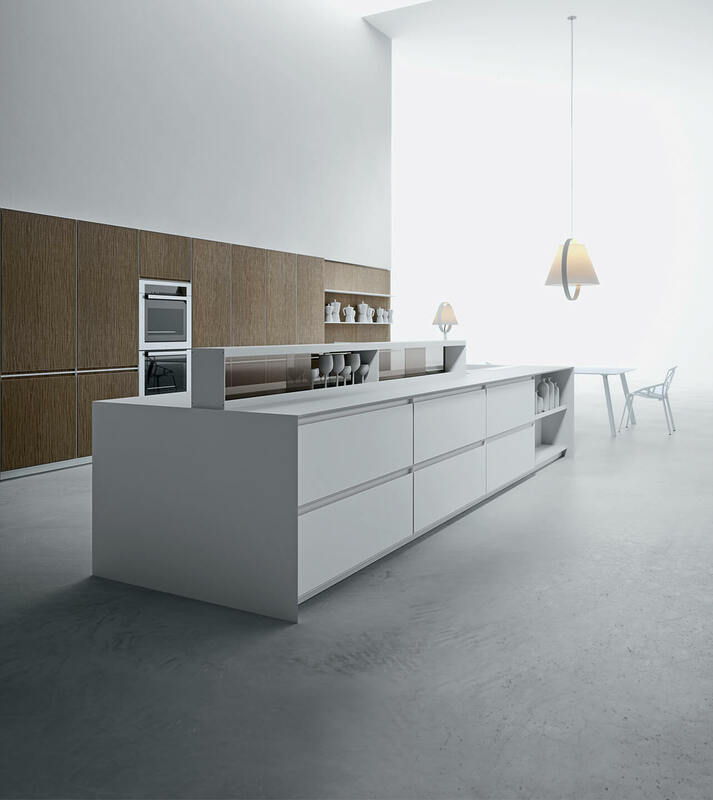 An innovative material obtained using nanotechnology, allowing the removal of micro-scratches, easy cleaning and the significant reduction of bacterial loads, with anti-mould properties and good resistance against acidic solvents and domestic reagents. 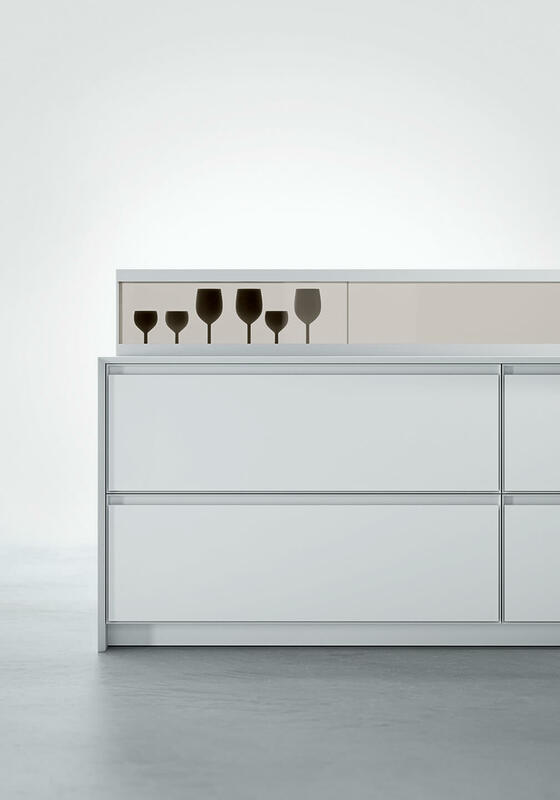 The option to have doors in the same finish as the top, together with the integrated sink tub, allow best coordination of all accessories. 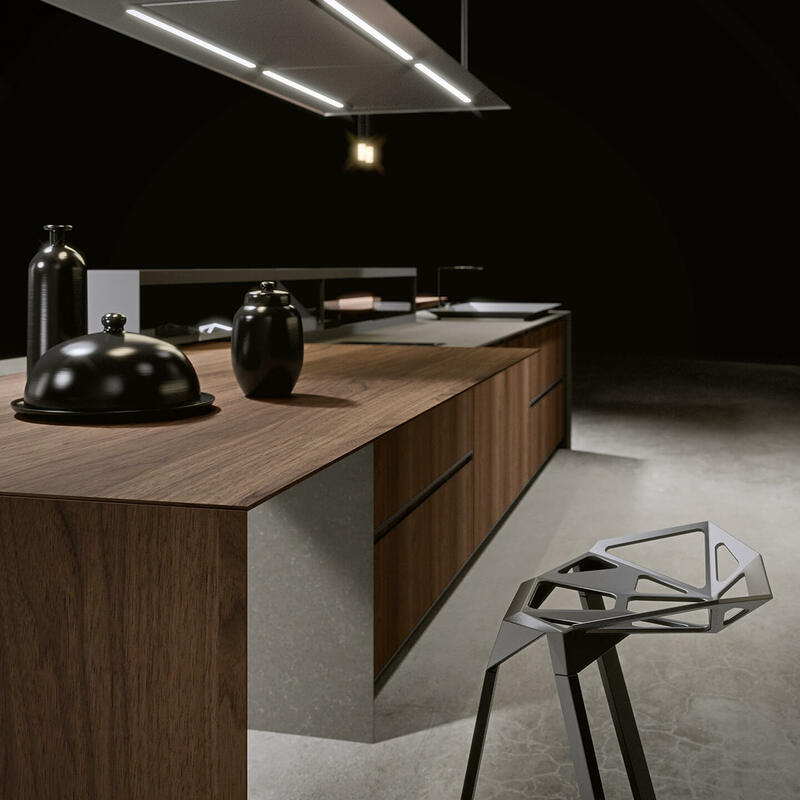 Characterised by a high visual impact, the new “Majestic” perimeter extraction hood has been designed using satin-finish steel, respecting the geometrical contours setting the Akb_08 system accessories apart. 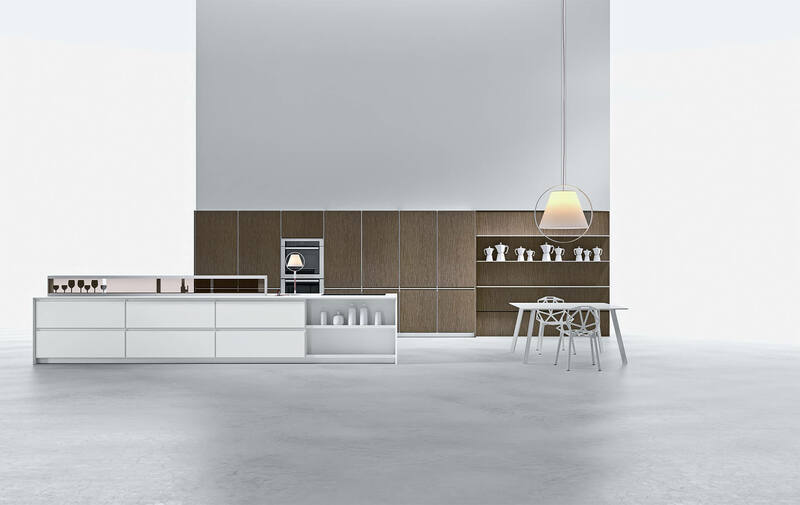 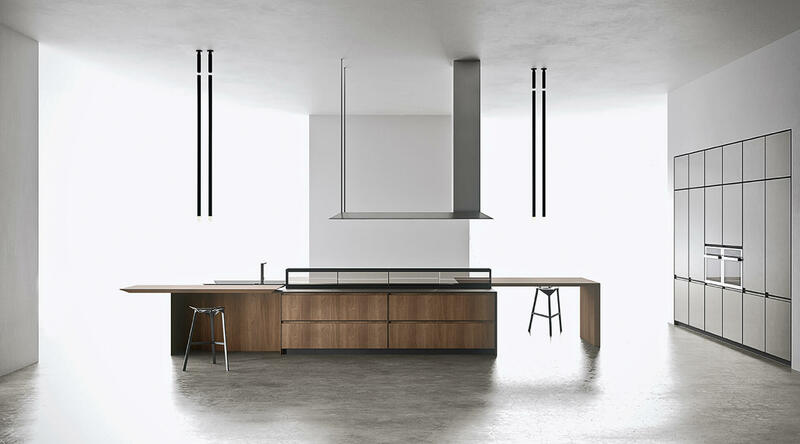 The Strato wood panelling allows the kitchen system to flow into the living area. 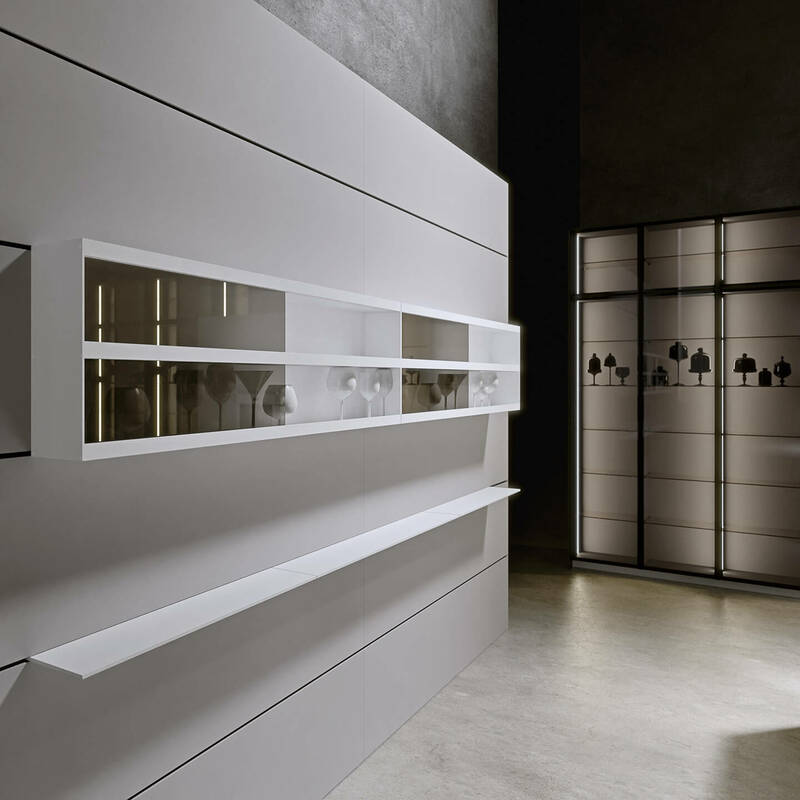 The combination of finishes and modularity allows the development of equipped walls in all sizes, offering unique, linear design solutions thanks to a disappearing installation system and the use of 1 cm-deep shelves. 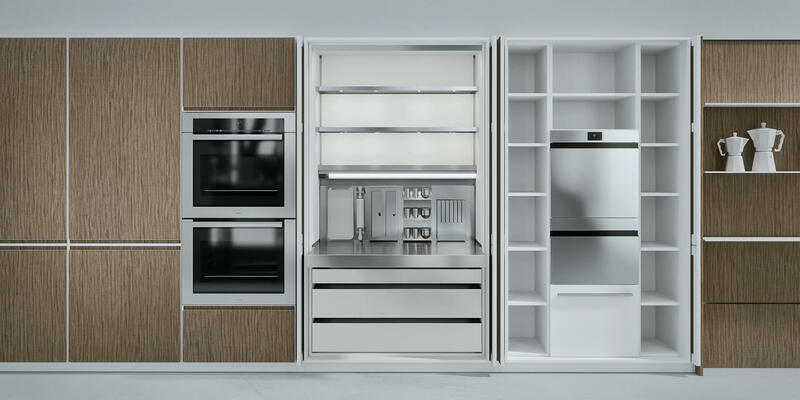 Internal drawers and deep drawers are organised in systems specifically designed to house cutlery, pots and all other equipment normally used in the kitchen every day. 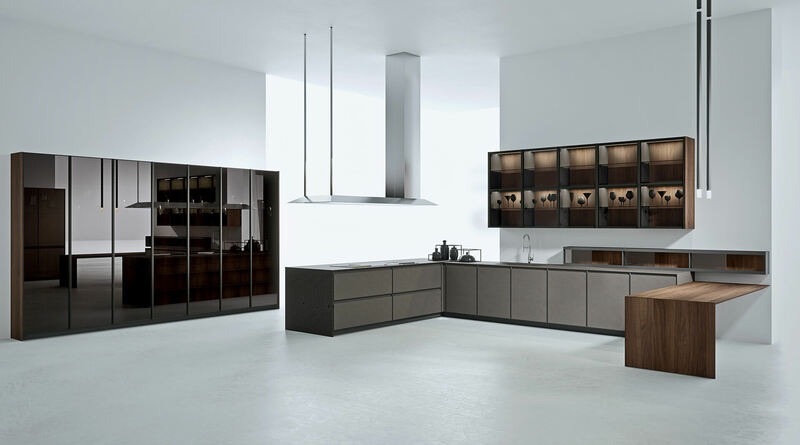 The operating principle behind these systems is based on an exclusive design, making use of different materials such as steel, painted metal and wood. 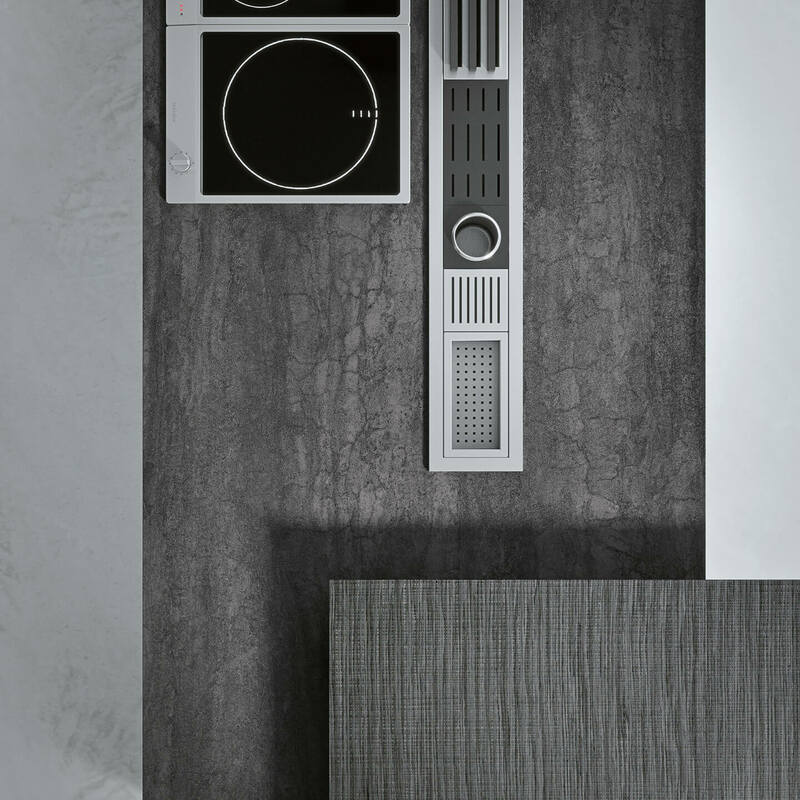 The different materials available for Akb_08 also include Fenix Ntm. 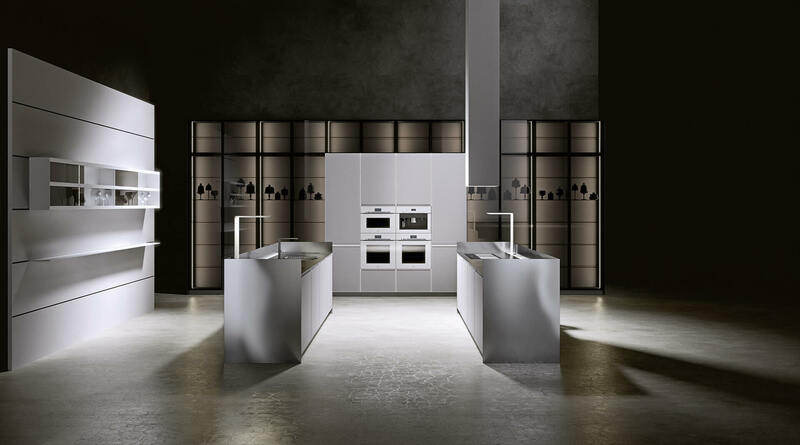 In addition to plain colour finishes, three new Doha finishes have also been introduced, recalling metallic finish surfaces. 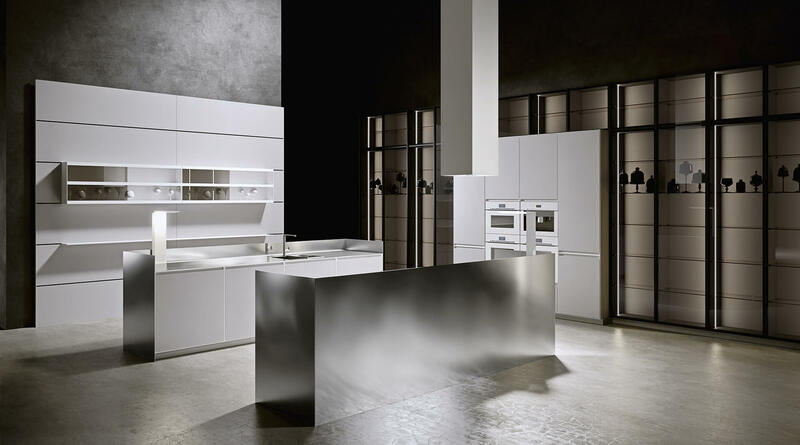 This material is set apart by its valuable technical properties, including: opacity, smudge-proof, softness to the touch and the removal of micro-scratches. 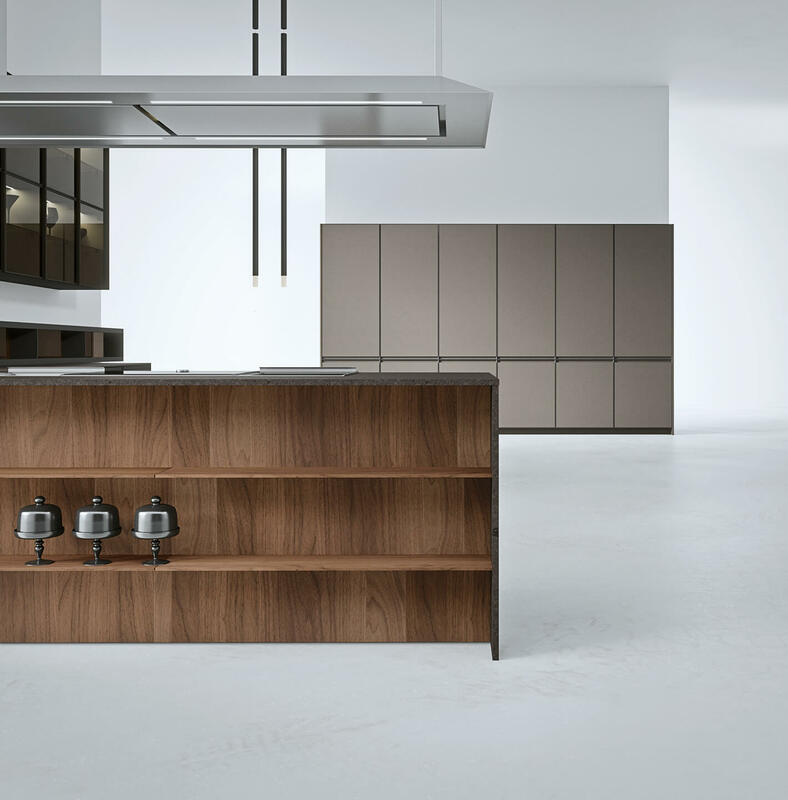 In a professional kitchen, all the utensils are on hand: the multi-purpose, stainless steel work tops increase the chef’s working area. 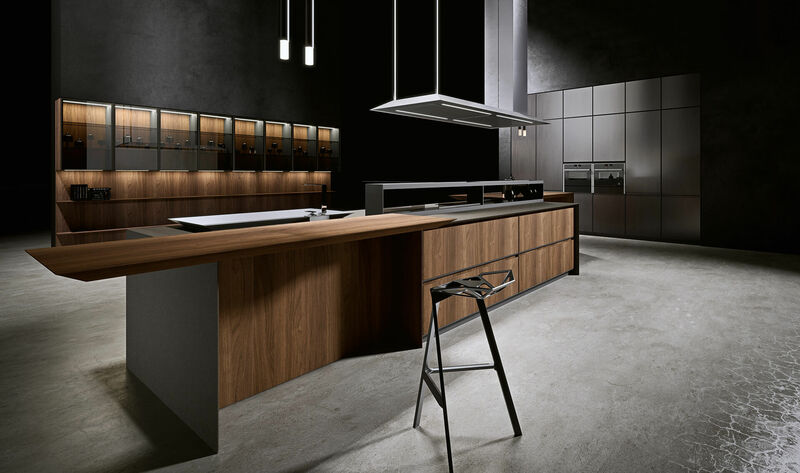 A pop-up panel, located near the sink, places all the utensils, you need for food preparation and cleaning, on the work top while a thin steel plate slides into position to provide extra space when the food does not need washing.